The indispensable guide for programming Perl on Windows systems. Updates coverage to current Perl version 5.6. Includes new chapters offering critical, needed information regarding security for Win32Perl, the topic most highly requested by reviewers and customers. Offers information available from no other resource on some of the most troublesome tasks and problems that plague programmers using ports of Perl on Windows systems. This book is a guide to Perl's most common Win32 extensions, grouped by their functionality. The new edition updates coverage from Perl 5.05 to current Perl version 5.6. The appendices have descriptions and syntax of each function in the extensions covered. Each chapter makes extensive use of code segments to illustrate the use of specific functions and real world scenarios in which these functions can be used. 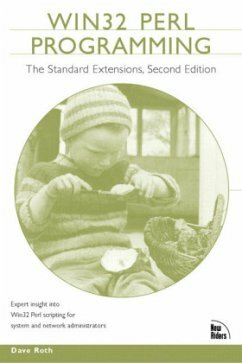 In the words of one reviewer..."I am already impressed since this is not some theoretical book like many others but also deals with an overview about Perl and how it's extensions in general work." Roth explains and lists the most common tasks like network administration, OLE, and data access. This is a needed update of a book critical to and known within the Perl community. Dave Roth is the contributor of various popular Win32 Perl Extensions, including Win32:ODBC, Win32: AdminMisc, Win32: Daemon, and Win32: Perms, and has been providing solutions to the Perl community since 1994. Dave has been a speaker at the O'Reilly Perl and USENIX LISA NT conferences. He has contributed to The Perl Journal and is the author of Win32 Perl Scripting: The Administrator's Handbook (1578702151, New Riders, 10/00). His code is used by organizations as diverse as Microsoft, the U.S. Department of Defense, Disney, Industrial Light and Magic, Digital Paper, Hewlett-Packard, Metagenix, Radcom, and various colleges and universities.